The founding of Nashua's St. Christopher parish goes back to 1950, when the Diocese of Manchester bought a parcel of land with buildings at Manchester Street and Cushing Avenue from Richard J. Sullivan. The original home, which was built by the Andrews family decades earlier, would eventually be converted into a rectory. While the church was being built, the newly formed congregation held services at Mount Pleasant School, just up Manchester Street, starting in July 1950. By Christmas, the basement of the new church was done, so the Rev. Lancelot Quinn and his associate pastor, the Rev. Gabriel Gamache, celebrated Christmas Eve Mass there. The occasion also marked the debut of the church choir, under the direction of Mary Herlihy. The church opened in the spring of '51, and on Nov. 11, New Hampshire Bishop Matthew Brady led a special cornerstone-blessing ceremony attended by Mayor Lester Burnham, acting Gov. and Mrs. Blaylock Atherton, and some 600 St. Chris parishioners. 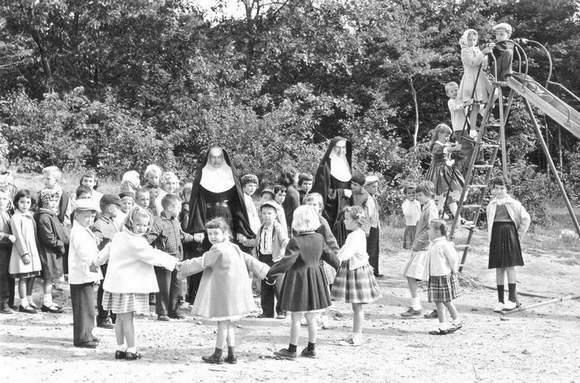 In the summer of 1952, St. Christopher acquired the old Shattuck Street Elementary School. Vacant for 15 years, the building needed lots of work, including major systems, as well as plenty of cosmetic and finish work. The work was accomplished by some 40 volunteer parishioners, who came after work each day to clean and paint the rooms and repair and varnish desks. When it opened that September, the school had just two grades – first and second – and 64 enrolled children. There were two teachers – Sister M. Francesca and Sister M. Celine of the Sisters of Mercy. When Msgr. Quinn died in 1960, his dream of a new St. Christopher Parish School was put on hold. Eventually, though, his successors picked up his project, and on March 2, 1964, the 355-member student body, along with the faculty of six sisters and two lay teachers, left the old Shattuck Street building for their new 16-classroom school.